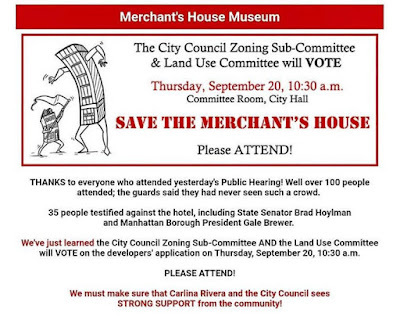 After the public hearing on Monday, the City Council Zoning Sub-Committee and the Land Use Committee will vote on the developer's application today to build an 8-story hotel next door to the Merchant's House Museum on Fourth Street between the Bowery and Lafayette. The developers, Kalodop II Park, are seeking a spot rezoning to build the structure that high. The public review process, the Uniform Land Use Review Procedure (ULURP), began in the spring. As noted in previous posts, preservationists, not to mention the leadership of Merchant's House, the circa-1832 building, are concerned that the construction could permanently damage the structure, one of only six residences in NYC that is both an exterior and an interior landmark. Sen. Brad Hoylman testified in front of the City Council's Subcommittee on Zoning and Franchising on Monday in opposition to the construction of the proposed hotel. 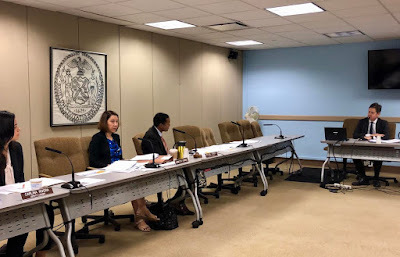 Hoylman joins Borough President Gale Brewer, Assemblymember Deborah Glick, Manhattan Community Board 2, preservationists, and residents in opposition to the current application. 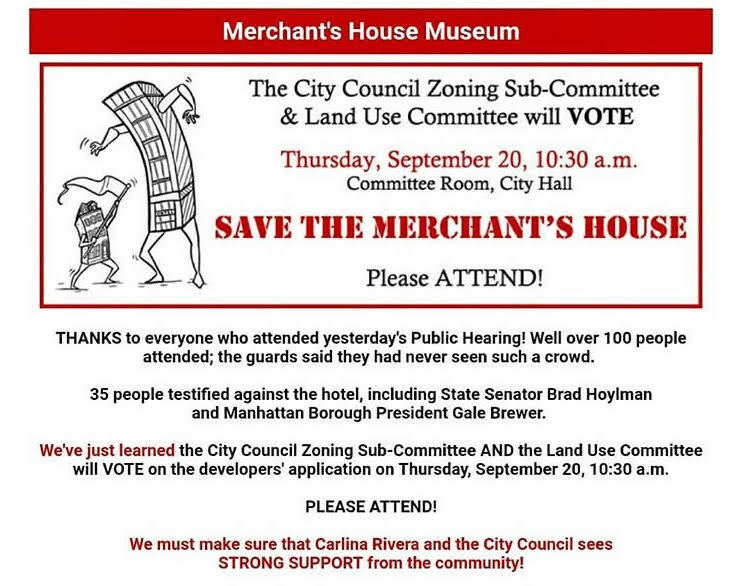 Senator Hoylman said: “The approval of this building would result in potentially irrevocable harm to the Merchant's House. Furthermore, our city’s zoning laws should not be changed at the behest of a single developer, especially when the survival of a 186-year old building like the Merchant's House is at stake. Today's vote is expected at 10:30 a.m. at City Hall (250 Broadway), Committee Room (2nd floor). The full City Council will weigh in next. This vote was only for the rezoning that would allow the eight floors.... the developer still can still build six floors as of right. More to come. The city must deny this developer who should not of purchased this land without doing some research this neighboring city, state and national landmarked museum building. This kind of remind me of Gregg Singer's purchasing CHARAS without realizing all the extra baggage he was getting along with the building. Developers in this neighborhood seem to think they're going to get the red-carpet treatment just for bringing money.